Google launched this social networking site in 2004 and it became an obsession among every one in India in year 2006. 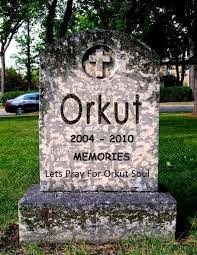 I was a 2004 passed out grad and Orkut was the only medium which kept me connected to most of my School & College friends. My Orkut memories are still fresh ! Although, many people from countries like Brazil and India still remained loyal users of Orkut until Facebook took over the spot in 2010., still never took the pride in US, that’s the reason for it’s fall. Took a hit by Facebook’s popularity, google had decided to close the door for Orkut a couple of years back itself, and it seems that the official word has finally come. “Over the past decade, YouTube, Blogger and Google+ have taken off, with communities springing up in every corner of the world. Because the growth of these communities has outpaced Orkut's growth, we've decided to bid Orkut farewell (or, tchau). We'll be focusing our energy and resources on making these other social platforms as amazing as possible for everyone who uses them,"